Note: This state is not included in the UBS plan. In this third stage of a translation project you will do comprehension testing and back translation. 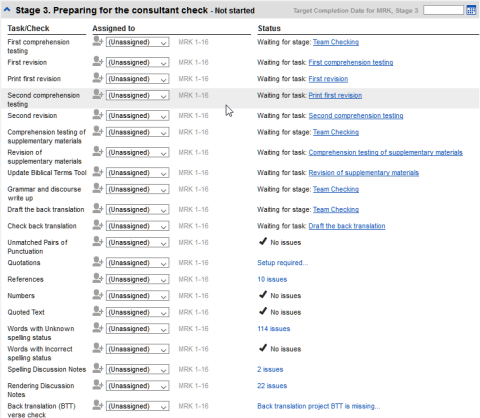 You will also continue with the basic checks and spell checking. You have typed, checked and revised your translation in Paratext and are now preparing for a consultant check. Before you can start your Administrator must have created a separate project for your back translation.Why is this important? Your text needs to be check by a consultant. But because the consultant does not know your language, you need to translate your text back into a language they can understand. This is where the term “back translation” comes from. The consult will use this translation to help your team improve your exegetical choices in the text. It is preferable that this is done by someone who hasn’t been involved in your translation. This way she will type what the text says and not what you meant it to say. This should also be done without looking at any helps or other Bibles.What will you do? Arrange your text on the screen. Mark the status as finished when you complete a chapter. Check that your text is up-to-date (or in sync), view any differences by moving to the next change if appropriate. For the Type of project choose "Back Translation"
Arrange the windows so that you can easily see both windows. Click in the back translation window, (the verse in your project is highlighted). Type your back translation into each verse (after the check box). Continue for each verse in the chapter. On the toolbar at the top of your back translation window, click on the arrow beside the check mark. Choose Mark All Verses in Chapter as Finished. All the check boxes for the chapter are marked with green checks. Paratext will detect any saved changes to your text and will change the back translation checkbox to a red question mark and add issues to the back translation status in the project plan. Click in a verse with the red question mark. Review and correct the back translation. Click on the icon on the toolbar to see the differences. A comparison window is displayed. Click on the up and down arrows to move to the previous or next differences. Click on the issues link A result list window lists any errors. The back translation window is displayed with the cursor in the first verse with problems. Correct the problem and move to the next outdated verse by clicking on the arrows on the toolbar. The checkboxes in a back translation can have a number of different symbols. B 2 No text/verse no. The previous module explained how to create a back translation that expresses what a reader understands when he reads or hears the text. There is another type of back translation that is sometimes used and that is a word-for-word style back translation. Some consultants may ask for this style of back translation. If you need to make one of these, you can use Paratext’s project Interlinearizer function. Please note that in Paratext 8 you can only use the Interlinearizer on registered projects. You will use the project interlineariser to produce a word for word gloss of the text. Firstly, you will setup the interlineariser, and then correct any errors. The computer’s initial guesses are often wrong but it learns as it goes and becomes quite accurate quickly. The idea is for the gloss to be correct even though the word order is not correct. 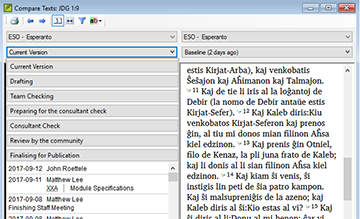 When you are happy with the verse you can export it to the back translation project. Choose your main translation for Based on. Choose your project as the text to interlinearise . Note: You do not need to use the "Model and text are related" checkbox – this is for when you are doing an adaptation (or orthography change). Click the incorrect gloss A list is displayed. When you approve and export the text any remaining red glosses will be approved. How do I open the Project Interlinearizer? How do I generate an interlinear back translation? 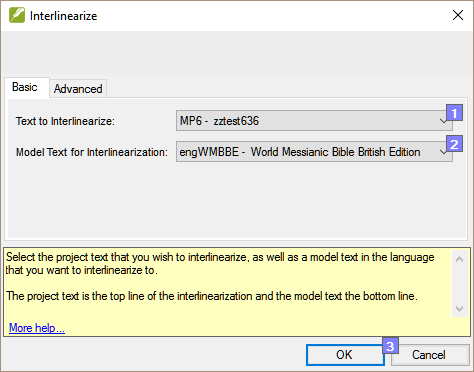 How do I create a back translation project with the Interlinearizer? How do I create a text revision/adaptation project with the Interlinearizer? What do the colours of glosses mean in the Interlinearizer? 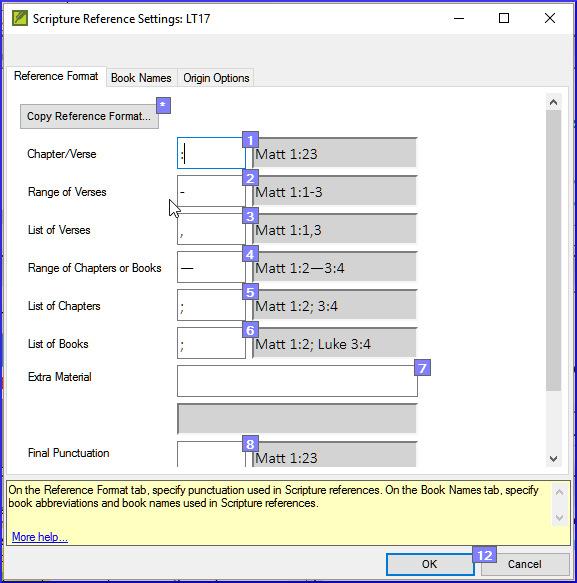 In this module, you will learn how to save old versions of your text and review them later.Where are we? You have worked on your text and you have arrived at an important stage of your project.Why is this important? As you work on your translation, you are continually making changes. It is good to have a copy of the previous version of your text, for example the text as it was before you went to a consultant check. You can do this by marking a point in the history of your project. After marking a point in the history, you can compare the version at that point with the current version.What will you do? Click in your project window to make it active (in Paratext). From the Project menu choose Mark a point in project history. Type a comment to describe the point. Note: It is good to start the comment with some symbols, such as ###, to be able to find the point in the long list. Choose the desired point in the history The screen will change and show the differences between both versions. This check looks at punctuation that occurs in pairs (opening and closing) and lists errors where it is not matched by the other half of the pair. This may be deliberate but is more likely to be an error, e.g. ( ), [ ], etc. Checking > Unmatched pairs of punctuation: If the list is empty, then there are no errors. If necessary, click Options... to add other pairs. Click OK A list of errors is displayed. Before you can run the references check, your Administrator must define various settings. 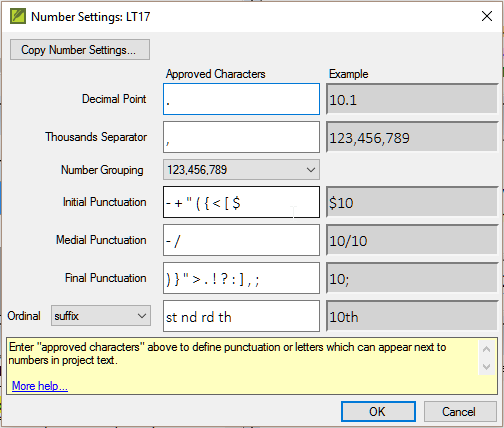 For each setting, type the punctuation in the box The sample will be updated on the right. 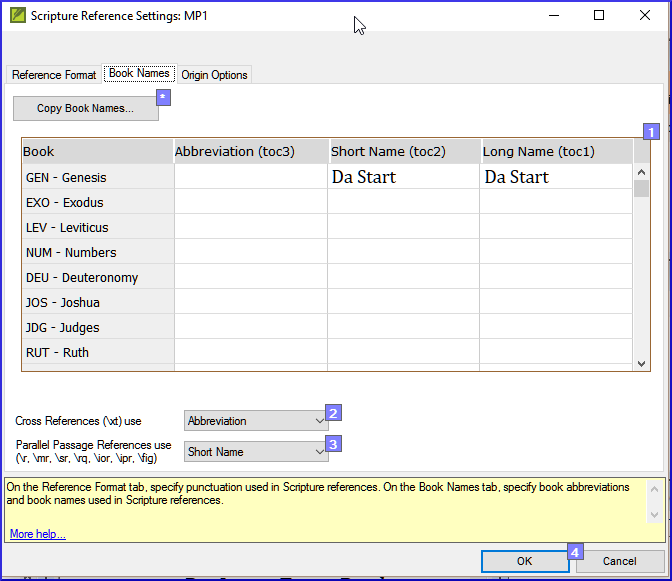 Fill-in the three columns  with abbreviation, short name and long name. Paratext will inform you if there are any inconsistencies between these book name settings and the \toc lines and will allow you to check conflicts. Before you can run the references check, your Administrator must define various number settings. Fill in the dialog box. The quotations check is used to ensure you have been consistent in marking the direct speech correctly. Before you can run the quotation check, your Administrator must define the rules for your quotations. Click OK. A list of errors is displayed. It shows possible errors but includes four correct quotations before and after the possible error. Click Rerun button to confirm you have corrected the error. The Quoted text check looks at text in footnotes or cross-references which has been marked with \qt \qt* markers. It checks that the quoted text matches the text in the verse. Note: the text has to be exactly the same as in the text. That is, even additional punctuation can’t be in the \qt \\qt* markers.